Audi A1 and others | What Car? 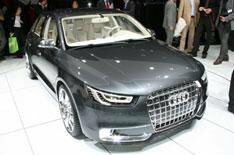 Audi is emphasising its green credentials with all three of its Paris show newcomers. Even the new S4 performance car looks positively frugal compared with the last model. Two of the show cars are currently billed as concepts, though there seems little doubt that we will see a large part of them in production some time in 2009. The first is the A1 Sportback, a five-door supermini that follows on from the three-door A1 project quattro revealed at the Tokyo motor show a year ago. The show model is a petrol-electric hybrid that combines a 150bhp 1.4-litre turbocharged engine and an electric motor, although it is unlikely this combination would be offered on the A1 production model due out next year not at first, anyway. Audi says the electric motor is capable of driving the car unaided in residential areas, with the petrol engine taking over on highways. Both units would work together when the driver wants more sporty responses. An electronic front differential lock would ensure the car could drive only the front wheels and still have good traction, thus reducing the need for a weighty, fuel-sapping quattro drive system. The A4 TDI concept e, meanwhile, is in the company's own words a near-production study. It is powered by a 120bhp 2.0-litre turbodiesel engine that emits only 105g/km of CO2 only 1g/km worse that the hybrid Toyota Prius and does almost 71mpg. Engine stop/start, brake energy recovery, weight-saving, low-friction tyres and modifications to many engine components all contribute to its impressive efficiency. The latest S4, meanwhile, has a new 3.0-litre V6 supercharged engine instead of its predecessor's 4.2-litre V8. So, despite a power hike to 333bhp, the S4 is now 30% more economical and commensurately cleaner.